My last 24 hours featured a lot of yo-yo behavior. I ate a huge amount of lasagna yesterday at lunch, drank a Coke in the afternoon, and tried to self-correct by eating a little bit of chickpea salad with cucumber slices for dinner. Things took a nasty turn after I took my nightly Lunesta, apparently. Sometime during the night, I slept-ate two (maybe even three) pumpkin spice cupcakes my sister left at my house over the weekend. My heart sank this morning when I saw the cupcake wrappers in the trash. I’ve had a few months free of the sleep-walking and sleep-eating that some people experience on Lunesta, and I am disappointed to see this side effect once again rear its ugly, sleepy little head. Full of cake and frosting and generally disgusted with myself, I broke out my trusty old South Beach Diet cookbook this morning and flipped to the well-worn first page of Phase 1 recipes. Luckily, the husband and I are always sorta on the South Beach diet, so we often have a lot of Phase 1 recipe ingredients hanging around. 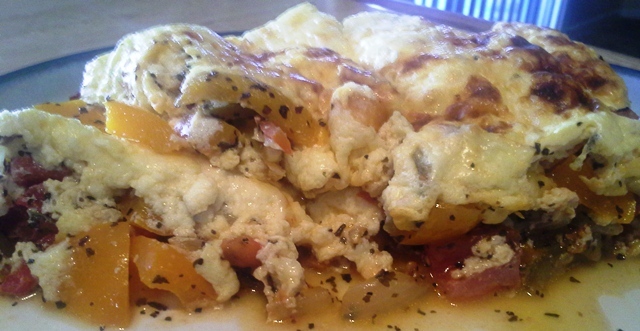 I began with breakfast – a Cheesy Frittata (picture below). While the frittata ingredients simmered and the broiler heated, I chopped up the ingredients for today’s lunch – the Greek Salad. For snack number one, I cut up half a red bell pepper. I grabbed a wedge of light swiss Laughing Cow cheese to eat with the bell pepper and a stick of light Sargento mozzarella string cheese to eat for my second snack of the day. When everything was cooked, cut up and put in containers, I piled my two meals and two snacks into a cooler, got ready for work, and headed out. I’m considering today Day #1 of South Beach Diet, Phase 1. I’ve never made it through this two-week phase without cheating. I’m hoping the accountability inherent in keeping this blog will make a difference. And tonight, I’ll have the husband stow sweets and peanut butter out of my reach. If I sleep-eat tonight, let’s hope I grab a stick of celery and not two (or three) cupcakes. This entry was posted in Recipes, Yo-Yo Dieting and tagged frittata, Greek salad, Health, Lunesta side effects, sleep eating, South Beach Diet, weight cycling, weight loss, yo-yo dieting. Bookmark the permalink. I had no idea that you were a sleep-eater…that must be so frustrating. Does it only happen when you take Lunesta? Anyway, thanks for the recipes–they look amazing and I plan to try them when I return home from my vacation. You have much better self-control than I do, especially when it comes to exercise. For me the hardest part is not cheating too. I get started on a healthy eating plan, cooking at home, snacking on fruits and vegetables, but then a week into it I start to wane. I cheat, I eat out and then all the good I did goes away. I fall into the unhealthy eating habits, and it’s hard to break away. I hope that I can follow your blog so I can continue to be motivated and not revert to the unhealthy ways.